Emily Jones is an Elves mini-doll figure first released in early 2015. Emily has five variations, all of which have the same hair. Her hair is long and reddish brown, and is tied in a braid. At the back there's a hole to place hair accessories like butterflies and various ribbons. All of Emily's variants have light nougat skin, curved black eyebrows, and medium green eyes. In the centre of her head she has a small circular nose. In her first variant Emily has a closed smiling mouth decorated in nougat lipstick, her cheeks are printed with three nougat freckles each. She wears a white and dark blue striped sleeveless shirt. At the top of the torso there's a light stone grey necklace with a medium azur amulet in the centre. She wears sand blue shorts and bright yellow and white shoes. Her second variation portrays her wearing an earth blue cape. Emily's third variation shows her in a new outfit. Her mouth has also changed, it is now open showing her white teeth. Her top is now dark blue, with white spots at the bottom half. She still wears her necklace around her neck. Emily wears dark tan shorts and red and white sneakers. Her fourth variant is unchanged, but shows her in a white cape with gold stars and moons. 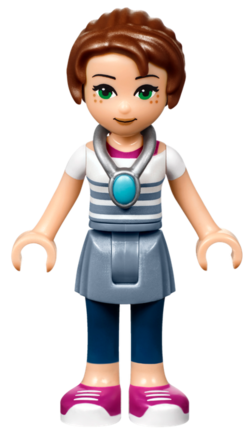 Emily's fifth variant shows her in a new outfit. Her mouth appears closed, like on the first and second variants. She still wears her necklace but her top is now white with blue stripes at the bottom and there's a pink top underneath. She wears a denim skirt with dark blue leggings, and magenta and white sneakers on her feet. Emily is an adventurous, clever, quirky, and creative teenage girl. She used to be shy but after visiting Elvendale she proves herself to be brave. Emily likes nature, adventures, her elf friends:Aira Windwhistler, Azari Firedancer, Farran Leafshade, and Naida Riverheart, animals, legends, and songs. After the death of Emily's grandmother, Emily is given an amulet from her grandmother in her will. Unknowing of the power the amulet posses she wanders around in her grandmother's garden. Emily's amulet creates a portal in a tree and she falls in. Azari greets her and the two become fast friends, Emily tells Azari she needs to return home to the human world. Azari brings her to Farran who also befriends Emily but is confused by her ears. Azari then gets Pluma to deliver a message to Aria in the hope she'll come straight away, which she does. Aria introduces herself to Emily and Emily tells her the story of how she ended up in Elvendale. Aria knows if they find the keys that were lost by the four sisters they can open the portal and send Emily home. The friends go to Nadia at her spa who finds a map that shows where the keys are. The five friends now embark on the adventure, their first stop is the middle of the ocean. They go on board Naida's adventure ship and eventually reach the middle of the sea. Emily figures the water key must be at the bottom of the ocean, Naida goes down and retrieves it. After celebrating over their victory Emily sings the friends to sleep. When they arise they set out for the earth key. They find out the key is located in the crystal hollow but it is guarded by Miss Spry. Farran convinces the angry squirrel that he is friendly, and will give the squirrel food in return for the key. After retrieving the earth key, the friends go to the bakery as they assume it's close by. Emily discovers the key is behind the lava fall that's beside the bakery. Azari uses her fire powers to open the lava fall and her pet fox, Flamy fetches the key. Now with three of the four keys the friends set out for the final key, the wind key. Aria builds a pegasus sleigh and they take to the sky in search for the key. They find out the key is inside a baby dragon's mouth and throw cookies at him, which he swaps for the key. Now with all the keys they discover the sky castle. Each of the elves (besides Naida) uses their powers for them to reach the top of the castle. Skyra refuses to let the friends open the portal to return Emily home. Emily gives Skyra a speech which states you shouldn't mourn forever and you should embark on new journeys. Skyra then reveals Emily's grandmother was her sister and one of the five sisters. She then tells Emily that she has inherited the power of love from her grandmother and she is a love elemental. Skyra gives Emily the title guardian of the portal and allows her to return home. This is a description taken from LEGO.com. Please do not modify it. (see the source of this quote) Emily is a smart, quirky and creative girl, who is mourning the loss of her grandmother. She is shy in new situations, but quickly finds her place in a group. She is very fond of nature, faithful, a bit of a dreamer and just impossible not to like. Flaws: Gets a bit insecure and clumsy when she finds herself in a new group (especially when they are all elves..). She is the only human character to appear in physical form within the Elves theme. She is technically one-quarter elf as her grandmother is an elf turned human. This page was last edited on 7 December 2018, at 21:48.